Vintage paintings, sculptures and illustrations of Indian subcontinent. The forms of Shiva riding his mount Nandi, his bull, or leaning on it or just in a posture suggestive of leaning on it when it is actually absent, with or without Parvati, are known as Vrishvahana Shiva. 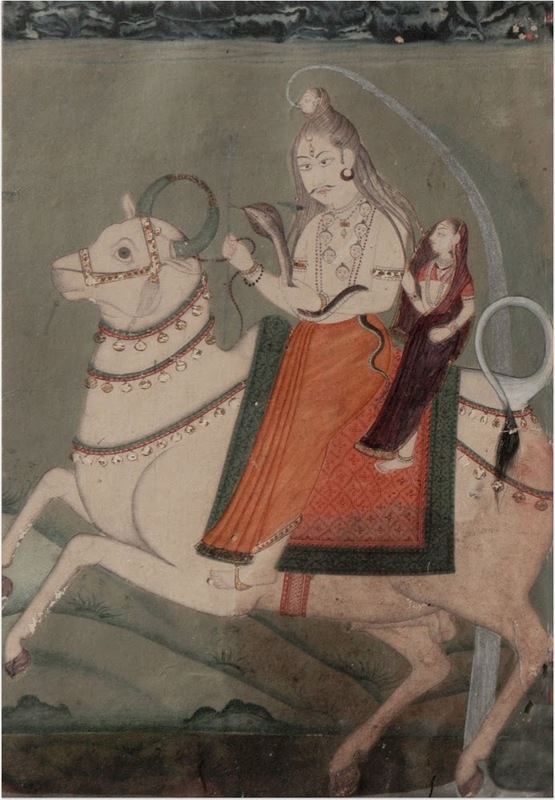 In the painting, Lord Shiva is riding his mount and Parvati is seated behind him, and the enthused Nandi is galloping like a horse. The artist has delightfully dramatised his canvas. Shiva's robust figure clad in traditional saffron antariya, an unstitched textile worn around lower half of the body, has been contrasted with a doll-like tiny Parvati attired like a coy purda-ridden Indian housewife, not like Shiva's consort, the model of timeless love and its perpetual manifestation in her being. Ordinarily, a stream of water gushing from his hair symbolises the presence of the river Ganga. But, instead of that, the artist has painted a female face, obviously the humanised form of Ganga, locked within the knots of Shiva's hair and the stream of water gushing from its mouth. Similarly have been dramatised Nandi's gesture, modeling and adornment of its horns and curvature of its tail, both making full circles.